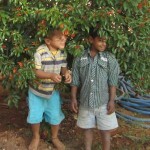 Greetings from Child Haven International’s Home for 225 formerly destitute children in Hyderabad, India. Bonniema and I arrive for the climax of the Home’s Summer Program, planned for the school vacation period. It has lasted for the past several weeks. Just after dawn, on our first day, the boy’s cricket and girl’s “kabbadi” finals take place in the comparatively “cooler” early morning, (the temperature reaches 109 degrees Fahrenheit by mid-afternoon). Kabbadi is a traditional Indian game in which team members who cross over into the other team’s half of the playing field are not supposed to take a breath until they return to their side. They repeat “kabaddi, kabbadi, kabbadi,” over and over so the referee knows they’re not breathing in. Both games are played with great enthusiasm and vigor and are the culmination of multiple earlier games. 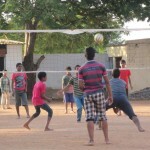 The second early morning, boys’ volleyball, and girl’s “kho kho” finals are held. Kho kho, another popular Indian game involves lots of mad dashes between seated players, with much laughter and shouting from the side-lines. 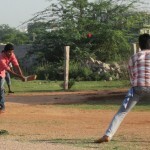 Kabaddi and kho kho require no special equipment, but great attention is given to measuring out a playing field marked with light sand on the clay dirt of the playground. 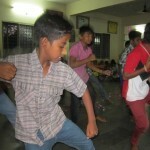 After breakfast, carrom finals, girl’s and boy’s, are held. 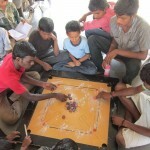 Carrom, a kind of table billiards, popular in almost all our homes, is played by flicking disks with your fingers into corner pockets of the playing board. These games are played with intense concentration and quite a bit of advice, cheering and commiseration from the assembled enthusiasts. The dining hall is freshly decorated with posters from a competition based on protecting the environment. 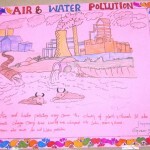 These could be posters from anywhere in the world highlighting the dangers of air and water pollution from industry and careless human behavior, but with an Indian orientation. They focus on concerns like keeping rivers clean so that water buffalo have a safe place to eat and bathe. Providing milk rich in fat and protein, water buffalo are also harnessed to plow rice paddies, and eat aquatic plants that could otherwise take over rivers and streams. The afternoons progress with the little kids playing in the shade, while the cooks escape the heat of the rice and dahl cooking in the kitchen by bringing vegetables out on the dining hall porch to chop in the light breeze. Pockets of girls sit and comb each other’s hair and carom continues to entertain. 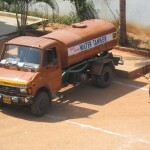 Later in the day a water truck brings a load of drinking water to fill the reservoir in the courtyard, much to the delight of the littler boys. The water available from the town pipeline is suitable for washing and bathing but not pure enough to drink. It is the great multiplicity of these kinds of expenses for our 1,300 Child Haven kids that keeps our monthly donations just barely able to keep up with monthly expenses. We also receive a visit from the husband-to-be of a staff member who grew up at the Home. He arrives with several of his family members. Their upcoming wedding is a source of much anticipation on the part of both children and staff. As Child Haven is the bride’s only family, we take on the traditional duties of a bride’s family; discussing her future living situation, making sure that she will be allowed to continue working (which is her desire), and agreeing to provide pots and pans, a bed, table and chairs and other basic household items traditionally provided by the bride’s parents. 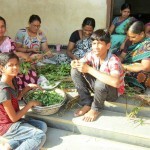 We also make clear that we do not believe in dowries, which does not appear to be a problem. After consultation with a Hindu priest to determine auspicious days, it is decided that the wedding will be at the Home, in several months and Bonniema will schedule her next trip accordingly. Everyone seems quite pleased with the deliberations. Our final evening features a dance performance, much singing, a play and a prize ceremony. Fortunately, all the kids receive a prize. Staff members have picked out a variety of beautiful and practical prizes including new towels, drinking cups, pens, belts and ribbons which are handed out with great fanfare. 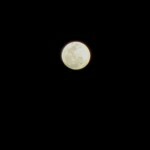 As I walk to my rooftop room for the night, the full moonlight, miraculously the same as the full moonlight I have enjoyed so many times, so many miles away, brings both a sense of longing for and connection with, loved ones far away. The gentle glow encircling, illuminating, conjoining all of us on this wondrous spinning sphere.